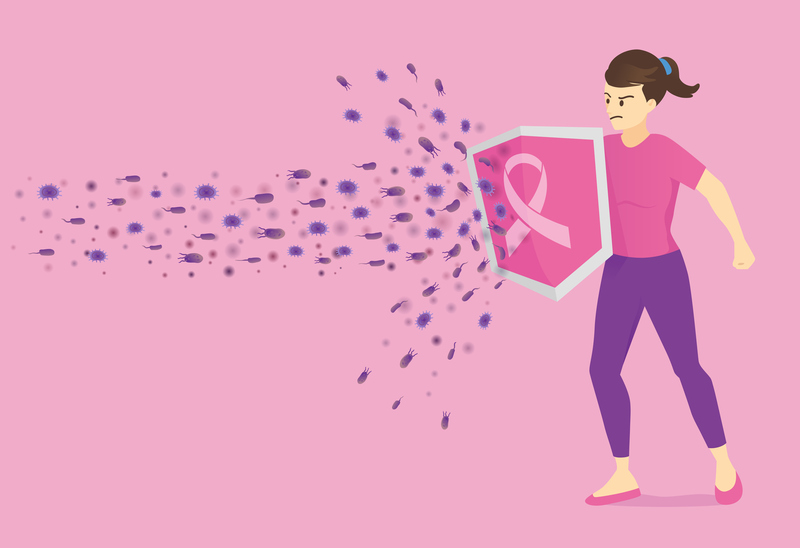 Woman used shield with breast cancer logo for protect cancer cell. Concept Illustration about health care and medical. Cancer researchers have always understood the power of combination therapies—blending two or more drugs together to fight the heterogeneous nature of tumors has helped push a number of patients into remission. However, scientists typically take a logical approach to drug design, often mixing therapies together that have modes of action that are similar or even in the same therapeutic class. Yet, when classifying cancer, logic is typically not a word that comes to mind, so researchers have begun to think outside the box for compounds that may be useful in thwarting this disease. Interestingly, the researchers soon discovered that the metformin plus venetoclax treatment only held tumors in check as long as the mice with implanted breast tumors were actively being treated with the drugs—once the treatment was stopped, the tumors grew back. The study shows that tumors were initially filled with tumor-killing lymphocytes. However, after the treatment, they largely vanished and the remaining killer cells expressed PD-1, a marker of immune cell exhaustion. To help the immune cells better fight the tumor, the researchers developed a new treatment strategy. First, they hit breast tumors with apoptosis-inducing drugs metformin and venetoclax to reduce the tumor size and to wake up killer lymphocytes. After the primary tumors were surgically removed, the mice were then treated with a triple combination: metformin, venetoclax, and a PD-1-targeted antibody, which is used in immunotherapies to keep killer cells active long-term. “With this combination, the survival of mice carrying implanted tumors was extended dramatically in comparison to mice that were treated with only single or double combinations,” Klefstrom stated. The researchers noted that this is a wonderful example of a translational study fundamentally aimed at taking research from bench to bedside. The key people from the University of Helsinki and Helsinki University Hospital (HUS)—basic researchers, pathologists, surgeons, and oncologists—were all involved at the earliest stages of the study. “This is a great example of how scientists in academia, leveraging highly specialized tumor models and applying their unique insights, can contribute to the discovery of potential new treatments for people with cancer. It is also a testament to the great research being done in smaller countries like Finland,” stated Joel Leverson, PhD, a senior scientific director at AbbVie and one of the senior authors in the study. “We finally have a drug combination that efficiently exploits MYC’s apoptotic function and most importantly, these drugs can be tested in the clinic in real patients. We are currently working hard towards this next step,” Klefstrom concluded.